Search for your perfect UAE domain today with a .ae domain name! Join many other happy customers who have purchased the UAE domain names they’ve always wanted from tasjeel. We have the best selection of competitively-priced extensions, perfect for websites that target customers in the Middle East. We have been accredited to represent the UAE since 2009! tasjeel.ae is the best place to get your UAE domain name. We’ve specialised in the sale of these unique domain extensions for 10 years, and we know all there is to know about using and registering them. Our official accreditation shows that we are a domain registrar that you can trust. Purchase your domain with complete peace of mind. We are an official registrar for all UAE domain names, which means you can purchase from us with confidence. Use our intuitive domain search to look for your ideal .ae or .امارات (.emarat) domain name. If the name you have chosen is available, you can continue on to our quick and easy payment process for a quick transaction. If your desired domain has already been registered by someone else, our search tool will suggest appropriate alternatives that are available for you to choose from. A .ae domain instantly speaks to the people of the Middle East. If you’re looking for a domain to represent your business in the UAE, this is it. Locals will see it and instantly know that your business caters to them and what they need. It creates familiarity and builds trust. .ae domains are popular and go quickly, so if you have an idea, we recommend you register it today before another business gets there first. Use our intuitive domain search tool to find the .ae domain name you want. If someone has already registered the name you had in mind, the tool will suggest alternative names that are available and close to the one you originally wanted. Our domain transfer service is simple and we’ve built an automated system to walk you through the process. You will have to speak to your current provider and make sure it’s OK to move over. Once you’ve done that, contact our friendly support team who will be happy to provide you with your next steps. How do I renew a .ae domain? It’s up to you! If you opt to use our auto-renew feature with your domain, you’ll never have to worry as your domain will automatically renew for another year when it reaches its expiry date. You can also manually renew domains from your control panel. What are .ae domain requirements? Are individuals able to register .ae domains? Are company or legal entities registrations allowed for .ae? Are there requirements, documents, or information needed for .ae? Are some .ae domain names restricted? Does .ae domain have a special use? Other information I need to know about .ae? Are there any additional fees for .ae? Do I need a trademark/brand name to register .ae? Is Private Registration service available? What is the registration term allowed for .ae domain names? The minimum term for .ae domain names is 1 year, with the maximum being 5 years. How long does it take to register my .ae domain name? The domain registration time for .ae is instant. What are the characters and valid character lengths for .ae domain names? How do I host my .ae domain name? tasjeel.ae offers hosting and email services for .ae. You can order hosting during checkout or you can contact our sales team. Can I hide my registration information? No. All information (name, email address) will be displayed on WHOIS. What is the grace period for .ae domain names? 3 days from the date of registration. Who is the registry that managed .ae domain names? 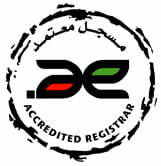 The managing registry is the Arab Emirates Domain Administration (aeDA). What are the .ae Domains Dispute policy?